Human effects on the global climate system, principally through changing the atmospheric concentrations of carbon dioxide and other greenhouse gases, are expected to lead to significant warming and other associated changes in the climate worldwide. Human-induced climate changes are likely already observable in quantities such as the global mean temperature, and over the next century can be expected to include significant effects on the local environment in Hawaiʻi and other Pacific Islands. The currently available climate change projections from global coupled atmosphere/ocean models, as summarized, for example, in the recent IPCC assessment reports, have very limited direct application to Hawai`i or other Pacific islands, as they have been performed with atmospheric models with coarse spatial resolution and hence completely inadequate representation of any of the Pacific islands. The observed 20 year (1990-2009) mean annual rainfall rate interpolated from several hundred rain gage stations. The rainfall rates are plotted over a high-resolution 3D representation of the topography. The approximate direction of the prevailing trade winds are shown at upper right. 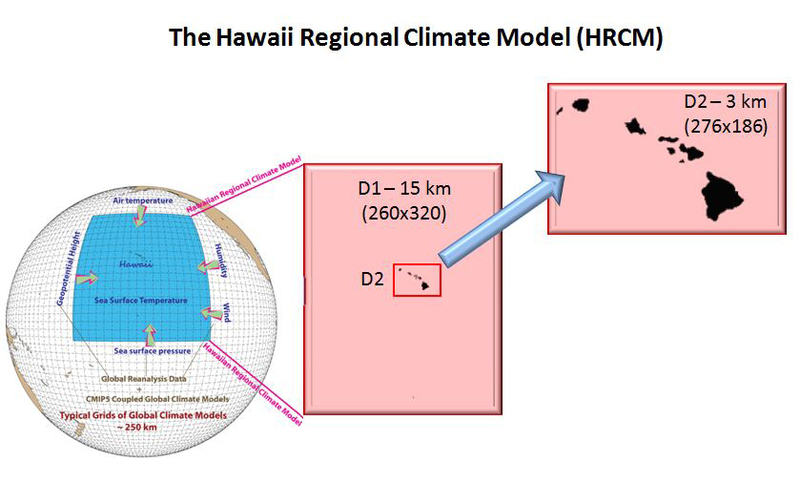 This project is using the output from standard global climate models as the basis for much finer scale regional climate simulations for Hawai`i. We have performed computer model simulations representing near-present day conditions and conditions at the end of the present century. Our projections indicate a warming of the long term mean surface air temperature over the Hawaiian islands of order 2.5-4°C with the largest warming expected near the summits of Haleakalā, Mauna Kea and Mauna Loa. Mean rainfall patterns are also projected to change significantly, with an overall pattern of increased rainfall over areas that now have high mean rainfall and decreasing rainfall over currently dry areas. The results of this study are now being used as input to efforts conducted by other researchers to assess the effects of these projected climate changes on aspects of the natural and manmade environments of interest to Hawaiʻi residents including freshwater availability, geographical distributions of plant species, agricultural practices, geographical distribution of avian malaria and consequent effects on native bird populations. We have configured a nested version of the advanced Weather Research and Forecasting (WRF) model with both high resolution and improved physics for the Hawaiian region, which we call the Hawai`i Regional Climate Model (HRCM). The HRCM includes a version of the Tiedke convection parameterization scheme. The HRCM was then further improved by including a new cloud microphysics package and introducing a detailed specification of surface properties (albedo, land cover type, soil type, and green vegetation fraction) for the Hawaiian Islands (Zhang et al., 2012). A 20-year (1990-2009) doubly-nested simulation of the atmospheric flow for the whole Hawaiian region was undertaken with an outer domain (Domain 1) with 15 km horizontal resolution and an inner mesh over the main Hawaiian islands and adjacent oceans with 3 km horizontal resolution. 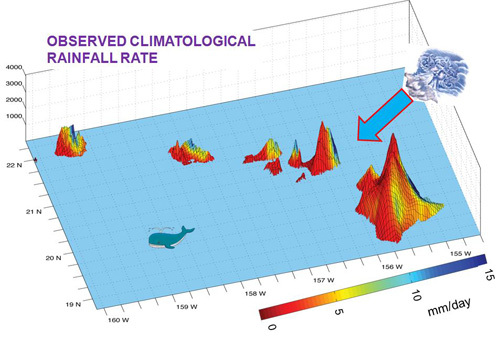 Results for this “present day” control run show that the 3 km mesh version of HRCM can simulate realistically the frequency of the trade wind Inversion, time-mean rainfall and surface variables on relatively small scales over the island of Hawai’i (Big Island). There is a reasonable agreement between observed and simulated mean rainfall patterns over the other islands as well. However, the detailed distribution of simulated mean rainfall over Kauaʻi, and (most particularly) Maui and Oʻahu reveals some significant deficiencies which we speculate may be due to inadequate resolution of the very steep topography on these islands. The anticipated forced climate change over the next century has been studied by conducting a parallel 20 year integration using boundary conditions based on the present day results plus “global warming increments” to the SST, air temperature, moisture and wind fields that are imposed at the boundaries. In this simulation the warming increments adopted are based on a multimodel mean of the projections made by 20 global coupled models forced with the “middle of the road” SRES A1B emission scenario. The results indicate that substantial effects on the Hawai`i climate can be anticipated by end of century and that the expected changes will have significant systematic fine scale structure over the individual islands in Hawai`i. Specifically the projection is for surface air temperature warming of about 2-2.5°C over the lower elevations on the islands, with an intensification of the warming with altitude, so that at the summits of Mauna Kea and Mauna Loa the projected surface warming exceeds 3.5°C. Mean rainfall is also projected to change systematically, with areas dominated by orographic rainfall or convergent flow In the boundary layer displaying increased rainfall, and currently dry locales dependent on convective rain projected to see substantial reductions in rainfall.